love this font for my 2 year old grandson. Thank you. 4 x 4 train engine is great, smaller train cars to fit say a 6 letter name on a shirt would be nice. This is very cute. Love to use for a boy. I vote this be a freebie, very adorable. 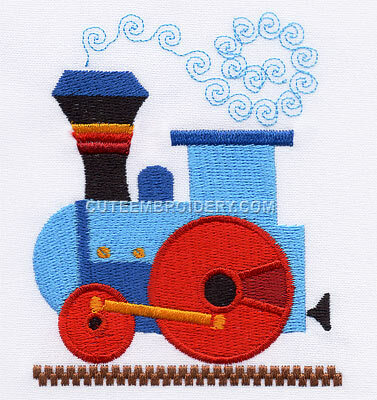 What Size is this Train font? Can I use it on a bib or baby tee shirt? I PUT THE ENGIN ON A JACKET FOR MY GREAT GRANDSON AND IT STICHED UP SOOO GOOD. LOOKS GREAT THANK YOU WFRIESLAND N.C. Very cute but there is nothing at the end.